Okay...second brood of babies are 8 days old today. Looks like they're progressing nicely, but the nest is VERY shallow, so we won't be opening the box again, I think. There appear to be 3 nestlings - even though there were 4 eggs initially. 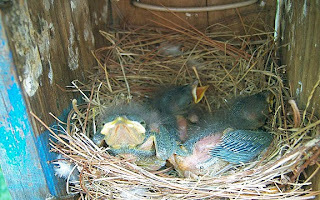 Mom and Dad are feeding them constantly, so hopefully they will grow and fledge by Sunday or Monday. What a blessing to get to see. Starlings destroyed a nest here this week. So sad. That shot is so cool... Nice work. I came across your blog while “blog surfing” using the Next Blog button on the blue Nav Bar located at the top of my blogger.com site. I frequently just travel around looking for other blogs which exist on the Internet, and the various, creative ways in which people express themselves. Thanks for sharing. What little and cute birds! I love them so cutie! OOOOOOOOOooooooo I'm totally in love in them! What fun! I was playing with the "next blog" button, and found your blog first thing. I quite enjoyed my visit here, especially as I'm the godmother to quite a collection of feeder babies myself.